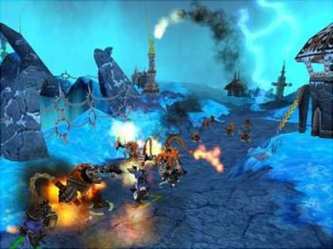 Goblin Commander (officialy known as Goblin Commander: Unleash the Horde), is a console-exclusive Real Time Strategy game created by the Miller brothers of Blizzard fame, who previous worked on games like Warcraft III and Diablo II. 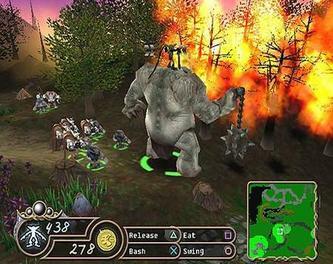 The game was originally conceived as a strong competitor for PC RTS games, by being completely exclusive to consoles and using controls optimized for them to the fullest extent. The game is almost completely unknown, not only by the gaming community by the professional community as well, selling less than 100,000 units, and missing reviews on multiple major gaming sites. However, despite its lackluster performance, it has been somewhat of a rare and valuable game, not only due to the fact that it is hard to find, but also considered by those who have played it to be the greatest console RTS of all time, with few contenders at that. Goblin Commander is set in the fictional land of Ogriss, a realm completely separate from that of Humans, save for one named Fraziel. Fraziel is a sorcerer who, throughout his entire life, has been working on something called the "Great Machine". The purpose of this machine is never known, but in order to create it, he, using some dark magic, conjurs up 5 races of Goblins to do his bidding, each aligned with one of the five moons. A good way into the creation of the Great Machine however, it is sabotaged by a then unknown perpetraitor, and the assailant also kills Fraziel as well. It is then assumed through a series of events that the leader of one of the 5 Goblin Clans, Grommel of the Stonekrushers, is the murderer, and the other four Clans set out to kill him for his trespasses. Throughout the rest of the game, Grommel must deal with his four Goblin brethren and their respective hordes of Clan members, and must defeat and control them to prove his allegiance to the late Fraziel. Gameplay in Goblin Commander: Unleash the Horde is, in many ways, similar to that of most strategy games, but with a few key differences. 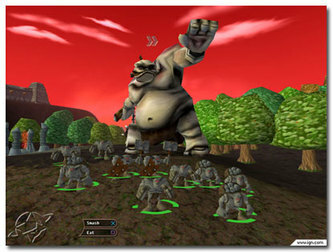 The basic layout of the game is that the player, the so called "Goblin Commander", controls a given Clan of Goblins, and using tactics and strategy, leads them on a 16+ mission campaign against the other Goblins. Each of the Goblin within a Clan are unique. There are roughly 6 types within each Clan, and each and every Goblin is different than another, with their own specialized abilities, strengths, and weaknesses. The 5 Clans that the player can (and will at somepoint throughout the game) plays as are as follows: The Stonekrushers, a Clan of mighty miners and warriors who rely on brute, melee attacks to do win their wars. 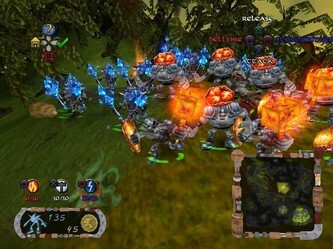 Hellfire, a Clan of clever and intuitive Goblins who have advanced technology such as flintlock guns and mortars, and reap the fields of war using long range attacks. Stormbringer, the magic oriented Clan of the game, they control the powers of Fire, Ice and Lightning, and using their different types of mages, lay waste to all in their path. Plaguespitter, a Clan which revolves around the use of incredibly fast units and fast acting poisons to demolish their foes as quickly as possible. Finally, the last clan is the Nighthorde, the theives and robbers of the bunch, who utilize various theft-oriented abilities to steal the resources and health of other enemies and benefit themselves. While each of these respective Clans is completely unique in terms of their Goblin units, there are also other things which each Clan possesses. The first of these is the Turret. Each Clan has a unique Turret, an automatic sentry gun of sorts, that does a different thing. For example, the Stonekrusher Clan has a Rock Turret that shoots rocks and will knock back and stun incoming opponents, the Hellfire has a "Lens Cnanon" which fries enemies to crisps, and the Nighthorde Clan has a "Soul Vortex" which saps the very life from enemies. Outside of the Turrets, you have one Titans. Titans are essentially Clan-specific "Super Goblins" which can do different things and act in different ways, such as the Stonekrusher's "Stone Ogre", a giant beast with a ball and chain who can eat enemies, or the Hellfire's "War Pig" who can trample foes and launch rocks from a catapult on its back. In addition to the units that you can buy however, there are also other things you can buy, namely Moon Stunes and Rune Stones. Moon Stones are special stones that you can either find in the environment or buy from an Observatory (which you must first capture), and they give a temporary boost in strength, speed, and health to all your Goblins. These Moon Stones are clan-specific however, so only one type of Moon Stone will work per Clan. The other kind of stone is the Rune Stone, and this is essentially a magic stone. It allows you, the Goblin Commander, to cast various spells in an area of your choice. Each of these RUne Stones does a different thing, like freezing enemies with a blizzard, opening up cracks in the ground to engulf foes, or even turning your enemies into Sheep and slaughtering them at will. You can, however, only have two stones of any type at once, so either two of them same, or one of each time, and once you use one- it's gone. All of this might lead you to the question however: how does one go about getting the resources to purchase or create all of these Goblins, Turrets, Titans, and Stones? Quite simply, by destroying everything, and capturing key points. Goblin Commander does not utilize a "base building" aspect like most games. No, you do not have harvester goblins who harvest resources to then build a base. Your base is built from the beginning of the game for you, and you must guard it with your life. If you want to purchase things within your camp however, you need to get one of two types of resources: Gold, and Souls. Gold is acquired in a few ways. The first is by destroying things. EVERYTHING in Goblin Commander is 100% destructible. You see a Castle in the distance? You can destroy it. You see an entire farm with trees and houses? Destroy it. Absolutely anything and everything can be destroyed. And when you do, the destroyed areas turn into Gold Coins, and go immediately into your Gold pot. In addition to this, you can sometimes find treasure boxes throughout the maps which will give you some extra Gold, but for the most part, you get Gold by destroying things and reaping the rewards. Souls are a little different though. Souls are mainly received by simply killing other Goblins. Want more Goblin soldiers? You've got to kill some first, though you always start out with some starting Souls to help build your army. In addition though, you can also capture "Soul Fountains" which reward you with a few souls every few seconds, and by capturing many of these you'll be able to get a constant flow of Souls in your soul bank. This brings us to the next area of the game: capturing and destroying. In this game, as you cannot make your own base since it's done for you, the only way to expand your "empire" so to speak is to go with your army around the map and capture areas and specific sites. For example, capturing a "Watchtower" allows you to see further through the unlit portions of the map, or capturing an "Observatory" let's you use it to buy Rune Stones. To actually capture however, all you must do is place even just a single Goblin by a structure long enough, and within a few moments it will become yours. I remember searching long and hard to find a really fantastic RTS for consoles. I probably looked around for about a month. But, I finally found one, and that was Goblin Commander. 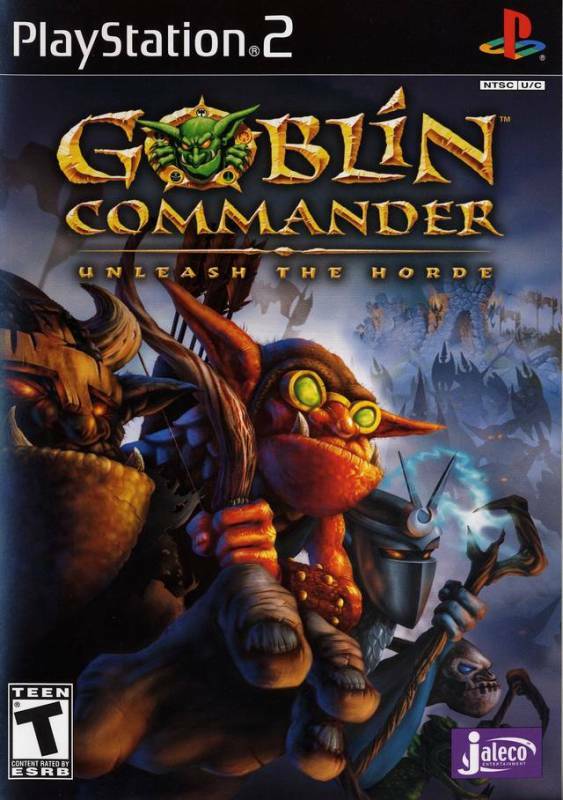 Sure, I had experienced PC RTSs before, like Warcraft, Starcraft, and Command and Conquer- but there was something interesting about Goblin Commander, it really intrigued me. So, after waiting a long time to actually find a copy of it, I finally did- and I fell in love. 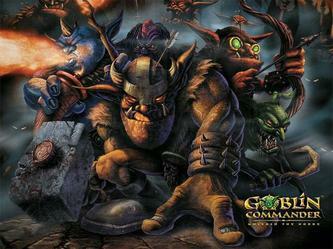 Goblin Commander is one of those games that's rough around the edges, but you can forgive it because it's so unique. It doesn't have the best graphics in the world, and a game like this will never be as responsive as a PC RTS, but for what it is- a console exclusive RTS- it does it really, really well. Well enough for me to honestly say I enjoy it more than Starcraft, Warcraft, or really any RTS out there right now. I think the thing I like most about the game is that everything is destructible. In most games, there's a limit. Yeah you might be able to chip a wall with your gun, or blow up a crate, or something lame like that...But no, in Goblin Commander, you see something you want to destroy, and you destroy it. Houses, castles, machines...Even entire towns, they can all be destroyed, ravaged, and turned into resources. It's a fantastic system, and one that really lends itself well to the whole "Come, see, conquer" approach to RTS games. When I play Goblin Commander, I feel like I'm on a war path. I build up an army of super-specialized Goblins, with their mish mash of different abilities and weapons, and then I lead them on a violent campaign of slaughter and destruction. You've just gotta' love it. Another thing I love about Goblin Commander is the art style. As previously mentioned, graphics aren't all too great, especially by today's standards, but artistically this game really stands out. You can really see the Warcraft influence here. Over the top, cheesy, oddball fantasy-themed graphics. Lots of big, blocky, colorful building and curvy lines, with a ton of interesting places to see. Winter-ravaged cityscapes, desolate and abandoned mountain lands, lush green forests, and so much more. To me, it's just this perfect blend of fantasy RTS style and all out destruction. It's not as responsive as PC RTS's, but damn it if it isn't just the funnest one I've ever played, regardless of its handicaps. Hold down R+L+Y until a message appears to activate the cheat menu. Enter a code twice to disable it. 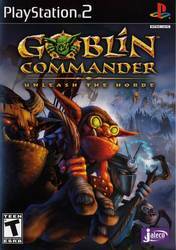 >>> Click here to access the Goblin Commander forum.